The launch of the publication SINDHISHAAN with the release of its' inaugural issue on the auspicious day of CHETI CHAND, 26th March 2001, at the hands of my mentor – who's ever since been a friend, philosopher and guide – Dada Jhamatmal Wadhwani – is an event I can still vividly and distinctly visualize and one which remains deeply imprinted in memory. 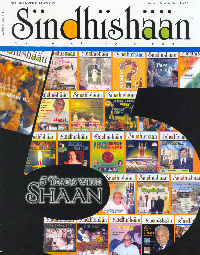 I have repeated my article 'GENESIS', which was published in Vol-4 issue-4, in this issue, which celebrates the completion of the 5th year of 'Sindhishaan'. Reminiscing over these 5 years I feel a certain sense of exhilaration and pride and consider this span of 5 years as the most eventful period of my life – during which I embraced a cause which went beyond myself and my family and gave my life a sense of direction and purpose. Most of you may be surprised to learn that before embarking on the adventure – which has since become my passion, my junoon – I really had negligible awareness and limited knowledge about my roots, origins, culture and heritage, beyond the nostalgic exchanges that I heard between the seniors in my family who had to migrate to Mumbai from Karachi post-partition. Although, I must say I was thrilled, when I accompanied my parents and relatives to Sind as a 16 year old and visited Sehwan, my family's ancestral home; Karachi, where my family later shifted and my grandfather taught at the D. J. Sind College and visited the college bungalow where the joint family lived for many years; and to hear everyone speaking in Sindhi, which was to me at that time the most striking and exciting phenomenon. I felt I was at a place I truly belonged. But besides this I had no interaction with Sindhi associations or panchayats, nor any interest in Sindhi literature, art, theatre, culture, festivals etc. Firstly, I was educated in the English medium and my friends and associates during school, college and working years were mainly non-Sindhis. The only limited attachment I had was to Sindhi music, that too because my mother and grandmother often held 'chonkis' at home and the 'Kalams' sung at these gatherings somehow left deep impressions on my psyche although most of the lyrics went way above my head. I distinctly remember the times Professor Ram Panjwani came for 'chonkis' held at my grandfather's bungalow when he was the Principal at National College, Bandra, Mumbai and as a 6 year old pampered child I listened to his renditions, sitting in my grandmother or aunt's lap. So when I proclaimed my intent to launch SINDHISHAAN my family members were quite surprised, to say the least; and that is an understatement. I was afraid that my son Amit, who had joined me in my business activities at that time, would start considering me as getting prematurely senile and wonder what crazy adventure his father was upto? And I wouldn't have blamed him or anyone else in the family for adopting this line of thinking as I had given no inkling or clue about my inclination or that I was the least bit interested in Sindhyat. I was busy running my business and trying to be a successful businessman, husband and father. Where was the time and need to start a venture without having any clue or relevant data or connections or a network? But to my great surprise, Amit turned out to be a pillar of strength and support and the encouragement he gave me tilted the scales towards going ahead, at a time when I was undecided and weighing the pros and cons of going ahead. As I said earlier, I had no contacts, no network and didn't know how to start the ball rolling. But that's when the Almighty above came to my aid. I started with an excellent team of dynamic, intelligent, dedicated and enterprising Non-Sindhi youngsters, Yes NON SINDHI! The intention was to start from scratch, with no pre-conceived notions, as if commencing on a research project. 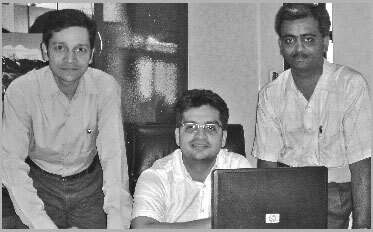 I must say I was fortunate to have R. Suryanarayan, Srikanth, Sunder Iyer, Manoj Nair as team members who took up the gauntlet, did research on who's who of the community, approached the community stalwarts and institutions and started building up data-historical, cultural etc. piece by piece; first to host the website and then to launch the publication. And here I must state that wherever they went and whomsoever they met they were received with unequivocal warmth and encouragement. I cannot refrain from specifically mentioning Shri Vijay Kumar Tejwani – who blessed me and introduced me to Shri J. T. Wadhwani; Shri Baldev Matlani – whose insight and depth of knowledge about Sindh and Sindhi history and culture proved invaluable; Shri Thakur and Paroo Chawla, for their blessings and encouragement at the initial stage and all along thereafter; who along with several others pillars of the community lauded my efforts without any reservations and went out of their way to assist me and were responsible for the initial impetus necessary at the nascent stage of any enterprise. Also, I cannot forget Shri Madan Jumani who literally held my hand like a father guiding his child through unfamiliar terrain; and my guru Vasudev Nirmal who taught me the Arabic Script. What has been truly amazing is the litterateurs, artists, educationists, philanthropists, businessman, social-workers and the intellectuals from the community that I have had the good fortune of meeting and interacting with in my capacity as the editor and publisher of SINDHISHAAN. Something which would have never been possible otherwise; relationships that I will cherish forever. Although not by intent, I can say I have received much more from the Sindhi community than what I have given. indeed the love and affection in return has been priceless and I pray to god that I continue to remain worthy of this benediction. With tears of joy in my eyes I say thank you to all mentioned or not in this acknowledgement of gratitude and seek your continued blessings and encouragement for this endeavour in the cause of sindhyat. for their encouragement and support by way of advertisements. who while remaining behind the scenes are the backbone of Sindhishaan.